Roy Hodgson was unfortunate that social media was around when his England lost to Iceland at the 2016 European Championships in France. Twitter went into overdrive and ridiculed the manager and his reputation, online at least, remained as low as ever. This is highly undeserving of one of the best English coaches in the last 30 years. Hodgson’s legacy is still highly respected in Sweden, a country he helped revolutionize alongside Bob Houghton as they implemented their 4-4-2 zonal marking style of play at Malmö FF and Halmstads BK. Hodgson also won the Swedish title on multiple occasions with Halmstad and later with Malmö. Since taking charge at Halmstad in 1976, Hodgson has managed clubs and national teams in eight countries. He’s managed the national teams of Switzerland, Finland, the United Arab Emirates and obviously England. At club level, he’s been at four clubs in Sweden, six in England, two in Switzerland, FC Copenhagen in Denmark, Viking in Norway as well as Udinese and Inter in Italy. He is a man who’s traveled the world and gained influences from all corners of Europe. His is a career to respect. It’s difficult to grasp the influence Hodgson and Houghton has had over Swedish football. As mentioned, they instilled zonal marking at their teams to great success, which led to other coaches, clearly influenced by the two Brits, to do the same. The most successful example is that of IFK Gothenburg who won the 1982 UEFA Cup with Sven-Goran Eriksson on the bench, a manager who went on to enjoy a stellar career in Portugal and Italy as well as leading the English national team. In a way, Hodgson had therefore influenced the English national team even before he became its coach. Now, Hodgson’s reputation is being restored again after joining his boyhood club Crystal Palace in September. After four successive losses, the patience ran out with Frank De Boer who was sacked and replaced by Hodgson. Hodgson first three games followed the same theme as they lost to Southampton, Manchester City and Manchester United. After seven games, Crystal Palace had zero points and hadn’t scored a single goal. In the eighth game, they beat Chelsea 2-1 and they haven’t looked back. Since the Chelsea win, Palace have only lost four games, with only two of them coming in the last 13. Hodgson has lifted the club from the worst ever Premier League start to 12th in the league. It’s a remarkable turnaround. Now let’s look at how he’s done it. Despite Palace troubles in front of goal, Hodgson’s first challenge was to shore up a leaking defense. He’s done it by going back to basics. His defensive system isn’t the zonal marking of 1976 but rather a positionally-oriented system where he preaches minimal distances between the lines and shutting off the centre for the opposition to force them wide. The players move in unison in relation to the ball and their teammates. The principles remain the same regardless of Hodgson setting his team up in a 4-4-2 as he normally does, or 4-5-1 as he’s done against the likes of City and United. Below is an example from the away game at United in only Hodgson’s third game in charge. No more than eight meters between the lines of defence and midfield. Below is their 4-4-2 against Chelsea. Hodgson wants a really tight midfield defensively, both when using four and when using five midfielders. The aim as stated is to block the option of going through the central areas and force the opponent wide. In the images below it’s clear to see how they work in this regard. Firstly, we have an image against Manchester City when Palace used five in midfield. 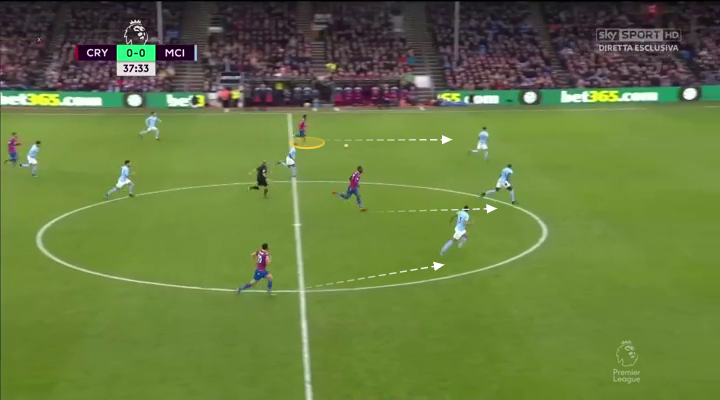 As the ball travels to City’s right-back, Palace’s left winger moves across to block the pass through the centre and instead show City wide. The full-backs are the one’s pressing in wide areas and normally stay a bit wider than the wide midfielders. Here’s is an even clearer example. Look how tight that midfield is. The left winger has moved inside to block a central progression and shows Chelsea wide where the left-back is ready to press. 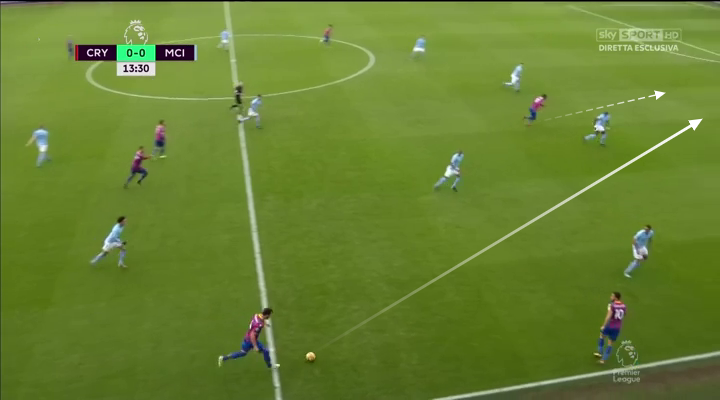 When the ball ends up in wide areas, Palace obviously needs to defend those areas well given their game model. As stated, the full-back goes to press the opposition winger and while the wide midfielder (yellow) gives support behind him. The remaining three midfielders (connected by line) defend the “golden zone”, the area for cutbacks where Paul Scholes scored so many goals. The ball-near centre-back (red) defends the first post area against a cross, the ball-far centre-back defends the space just in front of the goal and the ball-far full-back defends the back post area. Below is an illustration of this. One final example of the positionally-oriented defense can be seen below. This principle is so standardized now that few even pick up on it anymore. Have you ever heard a coach tell you that if a centre-back goes to head the ball the other defenders should drop behind him and create an auxiliary back-three as cover? Thought so. This principle is one of Hodgson’s constants and he applies it in midfield as well. Here, central midfielder Yohan Cabaye leaves the midfield line to press an opponent. The remaining three, the other central midfielder and the two wide midfielders cover the Frenchman as they create a situational midfield three behind him. 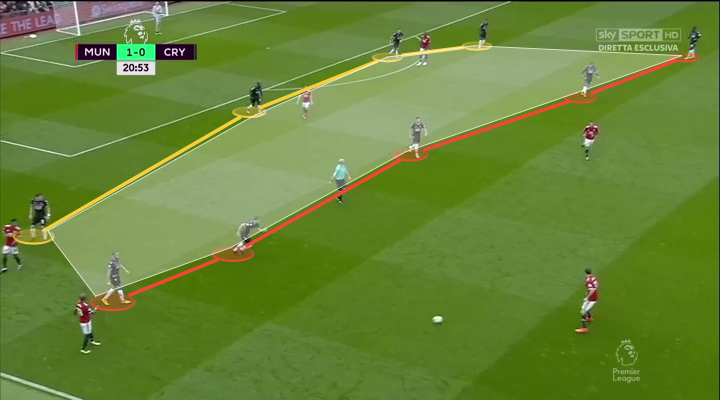 This approach is one of the reasons Hodgson likes his sides to be so narrow in midfield; it would be impossible if he played with Ian Holloway-style wingers who stay out wide hugging the touchline and rarely ever tracking back. 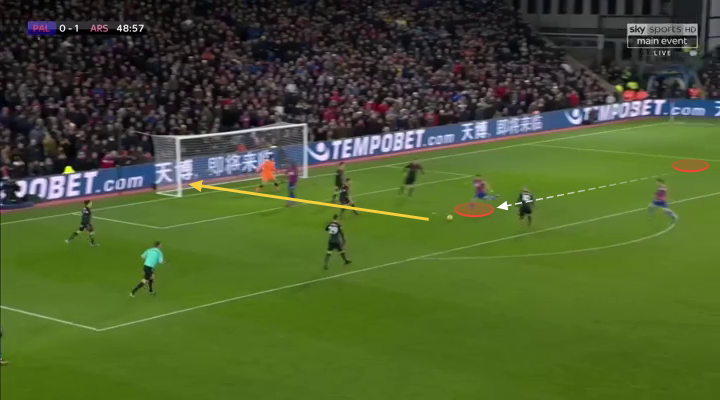 Hodgson’s defensive system is nothing new or innovative by any means, but it is clear the players have understood their roles completely and Palace are benefiting greatly from his defensive organisation. As mentioned, they’ve only lost two game in thirteen. Hodgson inherited a squad with some extremely good players in attacking transition such as Andros Townsend, Christian Benteke, Bakary Sako and the fantastic Wilfried Zaha. It wouldn’t make sense for him not to adopt a direct style of attack. But there is more to it than that. Firstly, let’s look at how quickly they look to exploit space with the pace of their front men. Here, Luka Milivojevic has just won possession. Zaha immediately looks to attack the space behind City’s high defensive line and the Serbian quickly sends a pass into the space. Here, Milivojevic has won possession again and Benteke is under no illusions about his next move: run in behind. Milivojevic instantly sends the ball into the space behind City’s defence. And in this last example they’ve just won possession and start a counter-attack with their two wide-men and Benteke. One benefit of a narrow midfield defensively is that they are closer to each other when they win the ball. Palace are more than just a counter-attacking side though. They have a nice variation to their attacking play and with the quality of a player like Zaha they’ll always be a threat. One signature move is for the ball-far wide man to get into the box from crosses, not at the back post but rather more centrally around the penalty spot. Their goals against Arsenal and Chelsea are good examples. Here, against Arsenal, Zaha beats his opponent and sends a cutback into the golden zone. Townsend has left his wide position and move inside to centre and scores with a first time effort. 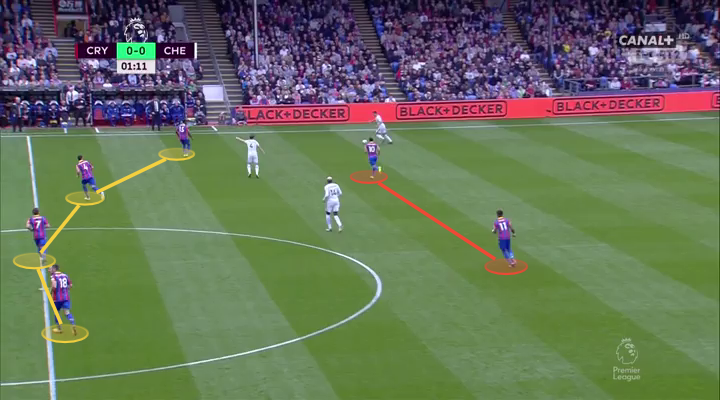 And here I’ve highlighted the position of the left-sided midfielder Jeffrey Schlupp who’s got across Chelsea’s central centre-back David Luiz and therefore attracts his attention which stops him from racing out to Cabaye. The delay by a fraction of a second is what stops Luiz from blocking the ball and allows Palace’s first goal of the season! As you’ve now noted, both goals comes from cutbacks into the golden zone, another trademark of Hodgson’s sides. 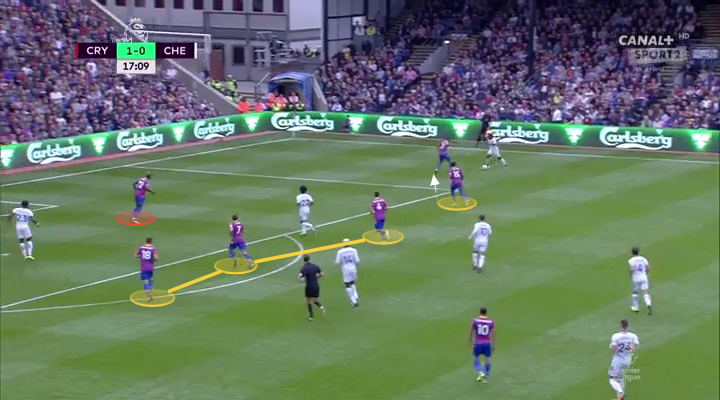 The most interesting aspect of Palace’s attacking play however might be their narrow formation also in attack. Hodgson, when playing 4-4-2, instructs both wide midfielders to move into central positions in front of their two central midfielders which creates a midfield box in the middle. The flanks are therefore left alone for the full-backs to attack. Of course, if he plays Zaha or Townsend in midfield they tend to play wider than the likes of James McArthur. Below is an example with McArthur just out of shot. Below is another example of the positioning of the wide midfielders behind the front two in either half-space. This positioning can create scenes as below, when Palace stagger the space outside the penalty area to win second balls and maintain pressure. Here I’ve highlighted the four midfield players with Schlupp just behind the referee. The left-back is attacking the space in behind Chelsea’s defense. Zaha is out of shot on the right while Townsend has dropped into midfield next to the referee. The fact both strikers are missing from the penalty area is no problem though since McArthur is so narrow that he can attack the space in front of goal. 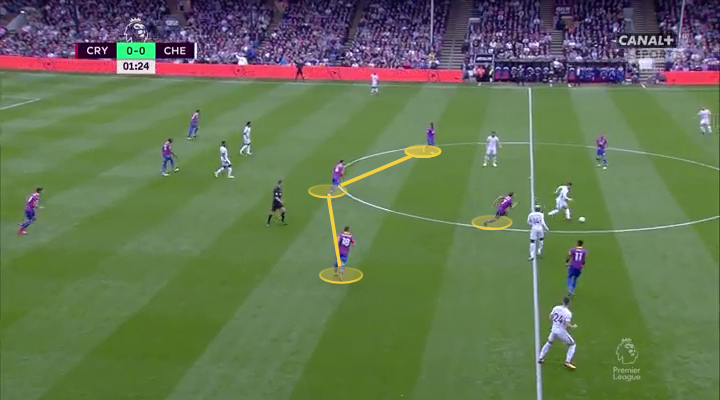 This type of narrow attack in some games combined with more wing-focused in others or pure counter-attacking against the best sides shows the tactical flexibility of Crystal Palace and their manager. Roy Hodgson’s coaching has dramatically changed Crystal Palace’s fortunes from being doomed after seven successive losses at the start of the season to now being positioned in 12th with a strong run of form with only two losses, both against Arsenal, in their last 13 games. For example, Palace became the first club in four months to deny Manchester City a win when the sides drew at Selhurst Park. Even on social media, the reputation of Roy Hodgson is being restored. In a career spanning almost five decades, one freak defeat can’t be the overriding memory. For Palace fans, their former youth player, is becoming a hero. He should be one for most English coaches and fans too.